This is a magnificent piece of engineering, builded in the times of Trajan, II century, by the architec Caius Julius Lacer. This important monument has a heigh of 57 metres, is 214 metres long and 8 metres wide. The bridge is supported on six graceful arches over five big pillars. 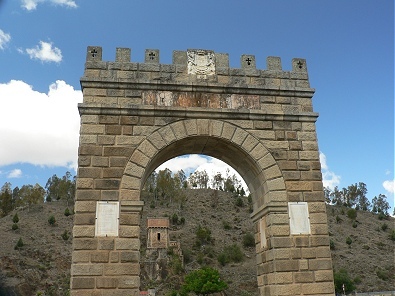 In the central part is located the Arch of Triumph with some memorial tablets. The name of the bridge comes from the arab name: al-Qantarat, meaning ‘the Bridge’, as they was impressed by the magnificent of this bridge.. 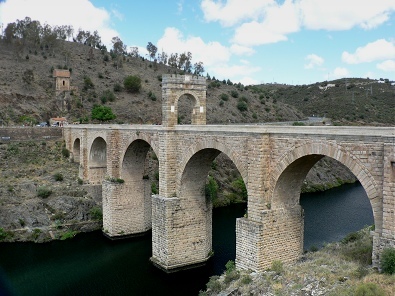 The Bridge of Alcántara was built about 106 BC by the roman architect Cayo Iulio Lacer on the road that communicates Norba (Caceres) with Conimbriga (now the portuguese city of Condeixa-a-Velha). 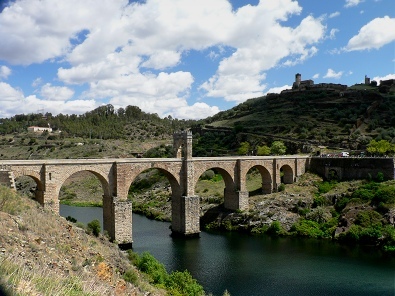 The bridge is composed by six great archs (some of them are about 30 metres wide) and cover a distance of 214 metres on the Tajo river. The archs are over five big rectangular pillars. The central archs are over 48 metres high over the normal level of water. The road of the bridge is 57 meters high. All these measures are very impressive, but they are simply functional and come from the need of saving a deep river with huge increases of water volume. In the center of the bridge, on the roadway, there is a Triumphal Arch that has been restored some many along the time. It is about 14 metres high and has some inscriptions with the date of building and words about Trajanus Emperor. 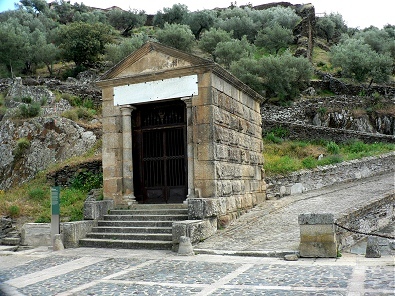 The first and second archs (near the temple) have been destroyed many times to defend the city of Alcantara (located in a high near the bridge), cutting the way for enemy troops. 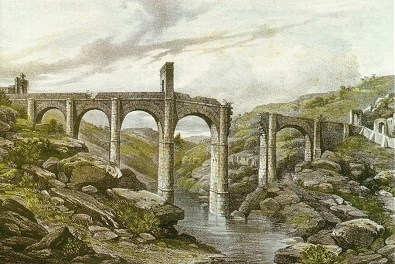 First time was in the XIII century, and the bridge was broken by about two centuries. 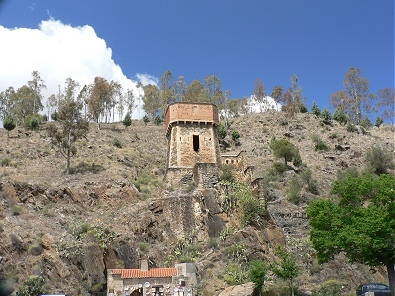 The second was in the middle of XVII century, in the wars with Portugal. And the third was in the XIX century, in the Independence War of Spain and France. The bridge was finally repared and restored in the middle of XIX century, by the Queen Isabel II. And later, in 1969, when the Tagus river was blocked by the Dam of Alcantara, the main pillars were repared to ensure the bridge health. Near the bridge, in the side nearest the city, there is a little roman temple with the name of the roman architect and the inscription: who will live (the bridge) so much as the world would live. At the other side of the bridge, there is a defensive tower called Torre del Oro (golden tower), built in the XVIII century.